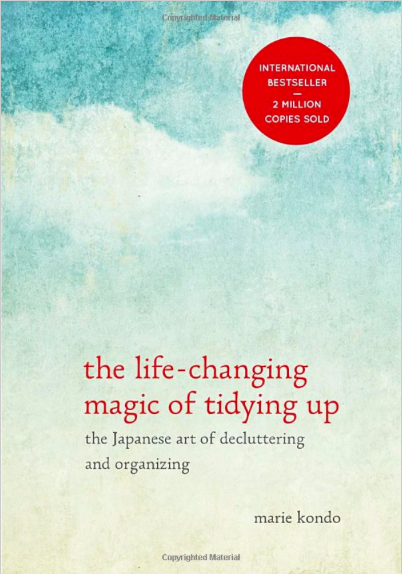 Late last year, Sweng and I put our hands on New York Times #1 Best-selling guide to de-cluttering, Kondo Marie’s book The Life-Changing Magic of Tidying Up – The Japanese Art of De-cluttering and Organising. It is Kondo Marie’s zen-like de-cluttering philosophy that intrigued and inspired us to start reading her book. Instead of conventional tidying up methods that give quantitative guidelines (reduce your bins of clothes into half, have X number of good shirts, pants, dress etc), Kondo Marie (or so-called KonMari method focuses on qualitative de-cluttering. “Does this item spark joy in me?” is the only question you need to ask yourself when you pick up each of your item, one by one, and answer truthfully. Since then, we have started cleaning out our house and both Sweng and I truly benefited from Kondo Marie’s teachings. We are both not hoarders to begin with, so the result is not life-changing, but it is indeed very gratifying to see living space in our wardrobes, filled with pieces that we individually love and now wear often. I also developed a habit of removing all my items in my bag after my day’s work and place them in allocated space (yes, every single item – purse, umbrella, keys, bus pass, small bags containing small miscellaneous item such as tissue packs, clipper and plasters). All my bags go into designated shelves much like parking lots for them. This gives me a sense of accomplishment every day. Things are tidier, the bags can breathe better and I can find my items easier. I must confess though that the organisation of books and toys in our house are still not up to the vKonMari standard. It is tricky with young children in the family. But I have made the silent resolution to deal with it some time later, probably the June holidays. It is a key point in the KonMari method that this de-cluttering work be done swiftly in a short span of time (in our previous experience, we took a week). And if done properly, we only need to do it once in our lifetime. The rest are just daily simple upkeep. It is gratifying to know that none of Kondo Marie’s clients have reverted back to their decluttering lifestyle after adopting her method and I can see why. If you truly follows through KonMari’s method, you would have internalised her philosophy and realised for yourself how many items you really need, what kind of lifestyle you really want to live, what kind relationship you want to build and other deeper realisation, and there would be no turning back because you would find yourself more peaceful and at ease with your present. So why would you want to go back to your old cluttered lifestyle?